TAMPA, Fla. -- There’s a danger in seeing the Holocaust as incomprehensible, unique, mysterious or even as an event, according to Edward Kissi, a professor in the Department of Africana Studies and an expert on the subject. And it is genocide prevention that lies at the heart of Kissi’s scholarly investigations into the history of the Holocaust. When Rosana Gatens, director of the Center for Holocaust and Human Rights Education at Florida Atlantic University, and subcommittee chair of the Florida Commission’s Task force on Holocaust Education, invited Kissi to serve on the committee to update the statewide high school curriculum, the professor didn’t hesitate to accept. Besides being a great honor, such work offers tremendous opportunities to advance his quest to provide the knowledge and understanding the world needs to prevent genocide. A lofty goal and a daunting one as the days and decades since the Holocaust create an ever-widening chasm--one that only education can bridge. For children, no less than young teachers, the World War II years appear to be ancient times and of questionable relevance. For the generation that has made the decision to “never forget” and to never let the likes of the Holocaust happen ever again, the responsibility to keep the lessons of that tragedy fresh is taken very seriously. The massive notebook with all the lesson plans and background material teachers are now using weighs several pounds. It is thorough, but it’s out of date. “If our schools are going to prepare future policymakers, they must have up-to-date materials and after 10 years, the curriculum is in need of updating. This is where scholars like me can offer advice,” he said. Kissi has established a world-renowned reputation of his own as one of the handful of experts on comparative genocide studies. He was called upon by the United Nations in 2009 to contribute a discussion paper titled “The Holocaust as a Guidepost for Genocide Detection and Prevention in Africa” for the UN’s landmark publication: The Holocaust and the United Nations Discussion Papers Journal. The committee’s work involves updating the bibliography and the concepts, making recommendations and then a group of teachers will be appointed to complete the curriculum teachers will put to use in classrooms all across Florida. The new curriculum will be ready for implementation at the beginning of the new school year in 2012 or 2013, depending on the teachers’ progress. Kissi didn’t start out planning to study the Holocaust or genocide. Born and educated in Ghana, he was interested in studying international relations to become a diplomat. In graduate school at Concordia University, in Canada, he found himself studying with Frank Chalk, the co-author of the seminal work “The History and Sociology of Genocide” and son of a Holocaust survivor. From Concordia Kissi went on to Yale University to become the first post-doctoral fellow in Yale’s newly-established Genocide Studies Program then headed by Ben Kiernan, author of the landmark work on the Cambodian genocide, “The Pol Pot Regime.” Kissi authored “Revolution and Genocide in Ethiopia and Cambodia” for his post-doctoral work at Yale and went on to become a visiting professor at Clark University where he met Deborah Dwork, director of the Strassler Family Center for Holocaust and Genocide Studies and renowned historian of the Holocaust. Until he met and worked with these highly-respected scholars, the Holocaust was just one of those things that happen when nations are building empires--atrocities, murders, mayhem. Greek and Roman history were full of appalling events. Every war could be counted on to provide horror stories. 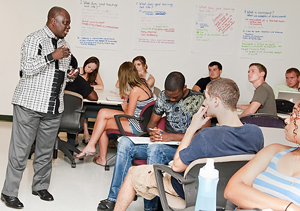 Kissi’s research, conversations with his colleagues and others turned out to be very influential in focusing his attention in a new direction. The Holocaust took on a new and deeper meaning. He began to see patterns and connections between genocides, famines and other acts of state-sponsored murder. In fact, his doctoral research found there were famines that were not accidents or happenstance resulting from droughts or the unavailability of food. Famine was often a tool of genocide. He emerged from all of this preparation at the forefront of a new field, comparative genocide studies. He teaches “The History and Theory of Genocide” and “Genocide and Human Rights” as well as courses on African history. “In studying the Holocaust, we study victims, perpetrators and bystanders, and I would add a fourth dimension to this, global reactions,” Kissi said. Now at work on a book about the African reaction to the Holocaust, he hopes to shed new light on the global nature of the Nazi genocide against the Jews. Kissi’s ongoing work will show how people in Africa interpreted the Holocaust in light of their historical memories of how Germany practiced wiping a group of people off the face of the earth prior to the 6 million Jews and the 4 million Roma, Black, gay, disabled and others it put to death. Considered the first genocide of the 20th century, the Herero and Namaqua populations were decimated between 1904 and 1907, decades before the Holocaust. Their numbers were estimated at 80,000 before the conflict and down to 15,000 when it was over. The German colonial authorities considered them subhuman and had planned to round them up to place on “reservations,” the pre-Holocaust version of the concentration camp. “The full story of the Holocaust is yet to be told and every child and every adult has the responsibility of helping to prevent a reoccurrence, but it can’t be done without knowledge and understanding,” Kissi said.